The Sauna & Steam Center is a local business, whenever in need, you can call on us and we will get you the help, parts, or service that you need. Now you can have a peace of mind from your investment and get ready to relax and detoxify in the comfort of your own home. Just plug and play! Our saunas are the best available saunas on the market. There are certain features that differentiate us and make ours Infrared Saunas the best. 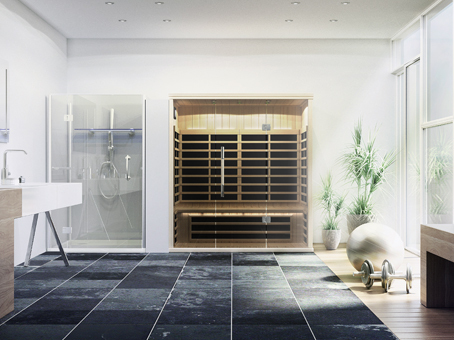 The design of our Infrared Saunas and the integrated CarbonFlex® panels ensures you receive the best performance and results from your infrared sauna. Independently verified by Intertek, our infrared panels produce the highest quality medical grade emitter wave length and the lowest electro- magnetic frequencies in the industry. These are validated by “Independent testing” by nationally known Intertek. Other companies testing claim to do the same, but are not Independently verified. Strategically placed emitters’ line all the walls of your sauna from floor to ceiling. These emitter panels are designed to give your entire body the infrared coverage it needs. This is extremely important in an infrared sauna because it provides a better session without “cold” or “hot” spots. One of the most common complaints about IR saunas is the uncomfortable sensation of cold spots in the sauna where no IR heat waves reach the body, and hot spots when seated directly in front of the old-style ceramic or metallic IR heaters. Due to the huge surface area of the CarbonFlex® heating panels, the heat is evenly dispersed and the surface temperature of the heaters is comfortable to the bathers. More importantly, the large surface area creates the perfect IR wavelength.